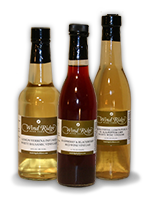 Our herbal vinegars are made one bottle at a time. The herbs are picked at the peak of their flavor, mixed with Italian red wine, white wine, white balsamic, or apple cider vinegar, infused together for several weeks until they are ready, and then bottled. This gives you vinegars with unequaled freshness and flavor. Each bottle comes with a vinaigrette recipe and suggested uses. Made with organic herbs, no salt or sugar, this is a naturally sweet salad dressing that is great on salad, or as an oil to stir fry veggies. We have made it easy too-just add oil and vinegar to the bottle of pre-measured herbs! Purchase refills and use the bottle again! Bottles of dressing are $6.00 each and 4.50 for a refill. Our seasonings are all free of salt, sugar, gluten, dairy, or artificial additives. The ingredients are certified organic or certified naturally grown and can be used in any dish. They can be used instead of salt, as a seasoned butter, oil, marinade, or as a dressing. This is the only seasoning you will ever need. It tastes great on everything-veggies, meat, fish, poultry, as a salad dressing or marinade. Slightly sweet without being overpowering. Excellent all purpose herbal seasoning that is great in soups, casseroles, stews, or as a seasoning for meat, fish or veggies. A wonderful blend of thyme, sage and other herbs, it is also salt free. My grandmother’s recipe, it is great in pie, muffins, bread, cookies. Wonderful combination of nutmeg, cinnamon, ginger, cloves, all of which are organic. Great flavor! You can use this on anything. Absolutely no salt, fillers, anticaking agents or anything else. Only certified organic lemon peel, black pepper, onion, and garlic. 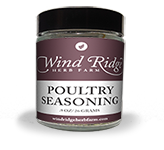 Another salt free, great tasting blend that isn’t just for poultry (It just happens to make chicken taste wonderful). Rosemary, lemon thyme, sage, with a hint of garlic make this a great addition to any dish. A fine blend of herbs that tastes excellent on soups, salads, as a marinade when mixed with oil/vinegar, use in any recipe. All ingredients certified organic. Classic blend used in french cooking, especially good on grilled meats/seafood or as an infused oil. A hint of lavender make this blend good on anything. A flavorful blend of four different peppercorns-black, white, red, and green. Whole peppercorns, which are delicious freshly ground over any food. Flavorful blend of classic Italian herbs. Just add to tomatoes, tomato paste and simmer for a great meal in minutes! Mix with tomato sauce and spread on pizza crust and top with your favorites. Also great as a bread dipper or to add to bread dough for a flavored bread. 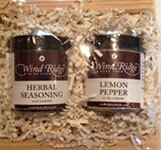 Our most popular seasonings packaged together in a miniature wooden crate, complete with a raffia bow. All are salt free, and certified organic.